When I go to a restaurant (on the rare occasions that I do) I get very upset about the tipping system. Every. Time. Even after 2 months of being in the United States. In the beginning it mostly upset me because I felt fooled, since the price I originally thought I was going to pay became about 30% higher. 10% taxes (yes, let’s not put that in the original prices to stay competitive with other restaurants that also don’t put the price with tax on their menu). And between 15 to 20% tips. 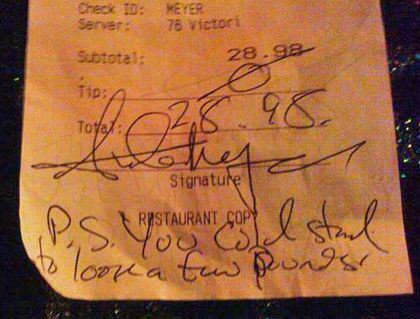 Tips are not a gesture that you make for thanking your service. No, it is socially obligated, where not tipping seems almost comparable to stealing your food. Because this is about all the money your waiter is going to get paid. Waiters officially make about 2 to 3$ an hour, and that’s before taxes. If you don’t tip, it basically means your waiter just worked for free all the time he served your food. And it is the second fact that upsets me the most. Why can’t they just include this amount that I’m supposed to tip in their prices and give everyone an official honest wage? You might say, well, just pay the damn tip and consider it as if it was included and stop making such a big deal out of it. But here’s where the perversity comes in; you can decide how much you tip. You suddenly become the waiter’s employer, deciding if they deserve to be paid. Common courtesy is tipping between 15 and 20%, and if you’re feeling like a generous god you can tip more. But you can always tip less (or even nothing!) if you’re feeling like a vindictive god. Maybe because your waiter didn’t attend properly to his holyness’ demanding needs, or maybe he or she didn’t smile enough. On a good night waiters can make good money, but on a slow night, they might have worked for peanuts, since no customers = no income. The biggest reason restaurants don’t get rid of tipping (except for the fancy ones) is to avoid taxes and to stay competitive. To up their prices in order to pay their employees honest wages means their prices will seem higher, making people probably not want to eat there. Instead they rather have their employees depend on the generosity of customers, and take the fall when it’s a slow night. Granted, some think it has its advantages since you will probably get better service, or from the waiter’s perspective that they will make more money if they work harder. But don’t they work hard enough serving on people for a 12h shift with a smile? And it’s not just waiters, it’s everyone serving you such as Bartenders (rule of thumb: for every drink you order at the bar you add another dollar as a tip), Cab Drivers, the Delivery Guy, even your Hair Cutter ! So while you think you are already paying the correct amount for what is listed, you’ve never really paid enough.